Members of the order Passeriformes, or perching birds, the swallow family (Hirundinidae) consists of 20 genera and many different species. The swallow family contains martins, as well. The habitats for these smaller birds vary greatly. Some species prefer to live closely with humans, even making their nests in man-made structures such as barns or homes. Although the 100 or so species of swallows vary in where they live and what type of setting they prefer to raise their young in, the family shares a couple of habitat preferences. These graceful fliers need to live near an acceptable source of freshwater, whether it be rivers, streams or ponds. Most prefer an open habitat with a suitable structure for placing their nests in. Most of their diet comes from flying insects; some species are known to travel 600 miles a day searching for flying food to feed their young. The genus Tachycineta contains the tree swallows. The small tree swallow (Tachycineta bicolor) reaching only about 5 1/2 inches long, prefers open habitats such as fields, meadows and shorelines. Their habitat is always in close proximity to water; marshes, ponds or swamps are ideal habitats. The breeding range for tree swallows ranges across much of North America; they overwinter in Florida, Central America or the Caribbean. The violet-green swallow (Tachycineta thalassina), on the other hand, prefers open forests -- either deciduous or coniferous-deciduous mixed. The barn swallow (Hirundo rustica) is slightly larger than the tree swallows reaching lengths of up to around 8 inches long. These small birds often nest in very close proximity to humans, sometimes becoming a nuisance. They build their nests either as a single pair or a small group of a couple of pairs. The only requirements they have for a habitat are a ledge, open foraging areas and a water source. As their common name implies, these small birds often nest in barns or outbuildings. 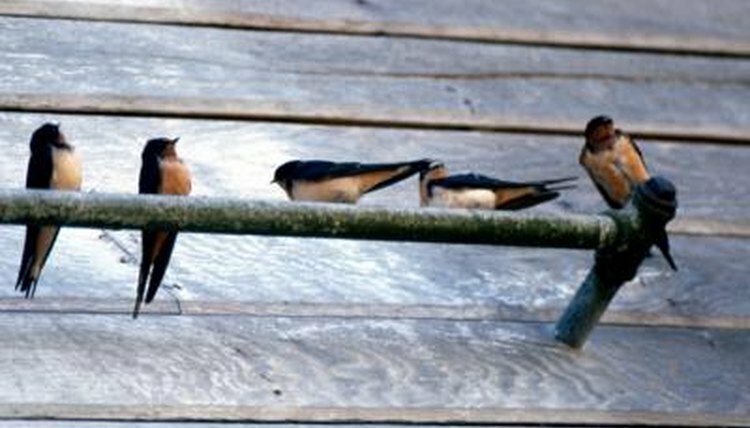 Barn swallows inhabit all areas of the world besides Australia and Antarctica. Cliff swallows (Hirundo pyrrhonota) tend to be more of a problem for humans than their relatives the barn swallows. While they build the same clay nests that barn swallows do, they tend to nest in large colonies -- sometimes up to hundreds of pairs. Barn and cliff swallows used to use rocky ledges near water or cliffs for their nesting sites, respectively, but introduced species and the convenience of man-made structures has moved them closer to human areas. The rough-winged swallow (Stelgidopteryx serripennis) and bank swallow (Riparia riparia) both prefer open habitat near water; both build their nests in crevices or dug-out tunnels in sandbanks. The differences between the two are that the bank swallow prefers to nest in larger colonies and often digs out their own nesting site; the rough-winged swallow prefers to nest alone or in very small colonies, and they typically use pre-made tunnels or crevices as their nesting sites. The Audubon Society Field Guide to North American Birds; John Bull and John Farrand, Jr.
What Kind of Bird Eats Mosquitoes?